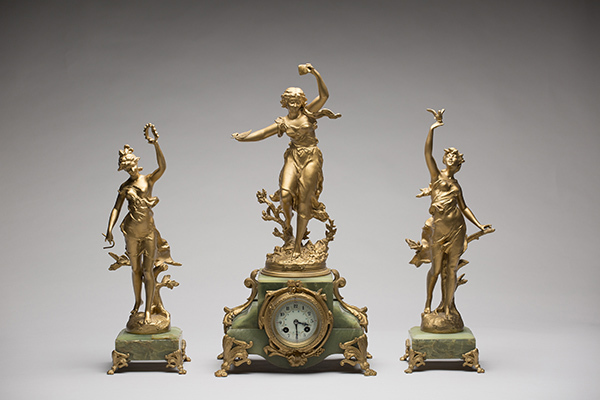 Ernest Rancoulet Ormolu Clock and two matching gilt figures (L’Idee), circa 1900, ormolu and mixed media, 1950/3/12-14. Collection of the Sarjeant Gallery Te Whare o Rehua Whanganui. Bequest of Miss F.J. Montgomery Moore, 1950. Several of the items currently on display in the Sarjeant Gallery Te Whare o Rehua Whanganui’s exhibition ‘Function & Fancy: Decorative arts from the Collection and Beyond’ have what appears to be gold on their surface. 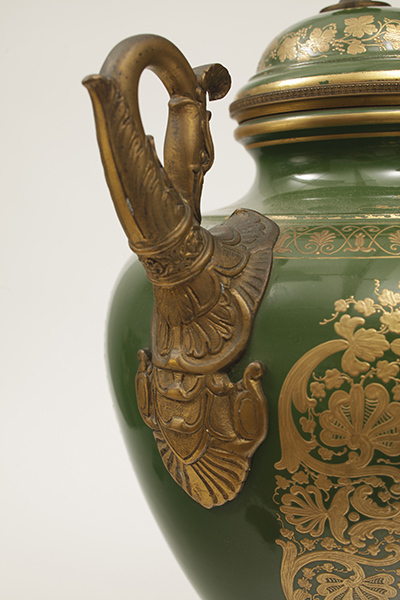 The gilding on these items is produced using a technique traditionally called ormolu. These items in the exhibition include the pair of Sèvres Style Vases painted by G. Poitevin and the Ormolu clock with its three figurines. The word ormolu is derived from the French l’or meaning gold and molu which means mashed or pounded. In English it is also known as gilt brass, gilt bronze, or fire gilding. This technique, which was popular in the 18th and 19th Centuries for furniture, jewellery, small statuary, and ceramics, fell out of favour due to the toxicity of the vapours produced and is now very rarely used. Ormolu involves mixing finely ground high carat gold with a mercury paste which is applied to the brass mount. The object is then heated in a kiln so that the mercury is vaporized, which leaves behind the gold fused onto the brass. Inhalation of the resulting toxic mercury vapour can have devastating potentially fatal effects on the nervous, digestive and immune systems, lungs and kidneys. 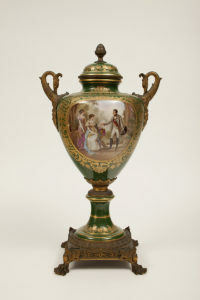 Sèvres Style Vase, Manufacturer unknown, painted by G Poitevin, late 19th Century-early 20th Century, ormolu-mounted green-ground porcelain, 1922/1/68. Collection of the Sarjeant Gallery Te Whare o Rehua Whanganui. Purchased by Mr and Mrs Neame on behalf of the Gallery, 1992. The Ormolu clock was made by Ernest Rancoulet who was born in Bordeaux, France, in 1870 and was renowned for producing detailed allegorical bronze figures influenced by both classicism and art nouveau. The three figurines probably represent music (the ring of bells), writing or knowledge (the scroll and feather quill), and nature (the bird). The three part clock was given to the Gallery in 1950 as part of a bequest from Miss F.J. Montgomery Moore. The figurines were originally gilded with ormolu however, at some point before they entered the Gallery collection, they were over painted with gold paint to cover the original gilded surface that had probably dulled over time. We are planning to engage the services of a Conservator to remove the gold paint and restore the clock and figurines back to their original condition. The exhibition ‘Function & Fancy’ is on until 16 April 2017 at both Sarjeant on the Quay venues: ceramics, silverware and glassware are on display in the gallery space above Whanganui i-SITE while the furniture is displayed at Sarjeant on the Quay, 38 Taupō Quay.